The African continent, particularly the Sub Saharan region is expected to witness a healthy growth in the construction sector, backed by government initiatives to revitalize the infrastructure sector. The construction outlook for countries such as Nigeria, Ethiopia and Kenya would remain positive over the coming years. Additionally, government initiatives to boost the residential supply in these countries to narrow the demand-supply gap would boost the real estate development. Such factors would strengthen the air conditioner market in Africa region over the next six years. Additionally, increasing interest of international hospitality brands such as Hyatt, Radisson and Marriott to expand in the African countries would back the growth of air conditioner market by generating additional demand for VRF and chillers to support their infrastructural needs. The sales of floor standing air conditioners are also gaining momentum in the countries due to their increasing popularity among the residential and hospitality sectors. Some of the key players in the Africa air conditioner market include - Samsung, Gree, Midea, Carrier, Daikin and LG. The Africa air conditioner market report comprehensively covers the market by types, applications and countries. 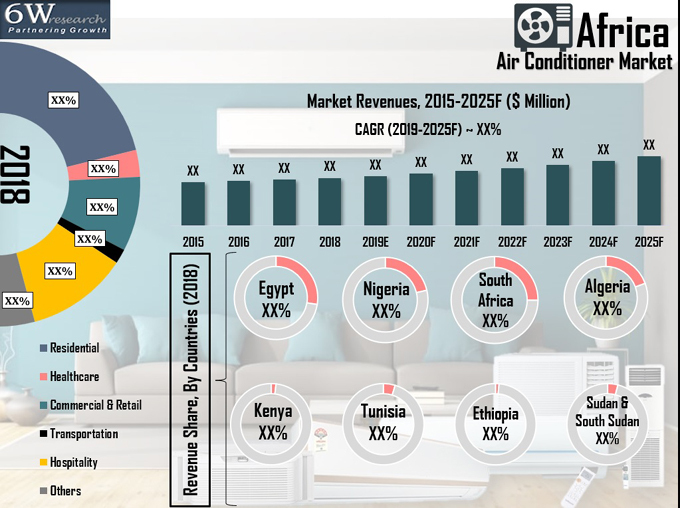 The Africa air conditioner market outlook report provides an unbiased and detailed analysis of the Africa air conditioner market trends, opportunities, high growth areas and market drivers which would help the stakeholders to device and align their market strategies according to the current and future market dynamics. Sudan Air Conditioner Market Revenues for the Period 2015-2018. Sudan Air Conditioner Market Revenues until 2025F. Air Conditioner Market Revenues by Types for the Period, 2015-2018. •	Africa Air Conditioner Market Trends. •	Africa Air Conditioner Market Overview on Competitive Benchmarking. •	Africa Air Conditioner Market Share, By Players. 15.2 Midea Group Co. Ltd.
15.3 Gree Electric Appliances, Inc.
15.10 Samsung Electronics Co., Ltd.